What is the profile of a marketing technologist? The prominence of marketing technologists and the chief marketing technologist (or CMTO) role has greatly expanded over the past six years. Just in the past year, the topic has been featured in an article in the July-August 2014 edition of the Harvard Business Review, and the first MarTech conference completely sold out. There is no denying marketing technology is hot right now. But few studies have been done to understand this group’s education, skills, gaps, and areas of expertise. How similar are marketing technologists to each other? How different? To help us shed more light on the emerging profession of marketing technologists, Sheldon Monteiro — the marketing technologist CTO of SapientNitro — took the initiative to design a survey with Decision Analyst, a market research firm. SapientNitro sponsored this effort — and provided 3 iPad Minis for the drawing. We’re excited to share the initial results. Here are the eight most interesting findings we’ve identified so far. 1. We identified six different archetypes of marketing technologists. We identified clusters of skills (“rank your strongest/weakest skill…”), and attitudes (“I think of myself as…”) to define six archetypes of marketing technologists. These archetypes are quite different. The largest, the Marketing Maven, focuses on strategic marketing management, while the second, the Infrastructure Architect, focuses on technology infrastructure and IT. The development of unique areas of expertise within the marketing technologist role is clearly seen in these data. For example, there is a group highly focused on cutting-edge, emerging technology (the Experience Engineers). But there is also a group with big data chops (the Data Divas). Is this a sign that the marketing technology field is maturing and growing more specialized? Is that a good or bad development, given that a large part of the marketing technologist role should be about bridging silos? See the attached infographic for more about each. 2. Less than 26% of today’s marketing technologists have a STEM undergrad degree. …and just 19% had a STEM (Science, Technology, Engineering, or Math) graduate degree. Instead, business majors dominated at the graduate level, while undergraduate majors varied greatly: 31% of respondents majored in social science, liberal arts, or actual art — including drama and theater — in their undergrad studies. 3. Marketing technologists come from both marketing and technology disciplines. Marketing managers are the #1 job leading to a marketing technologist. But as a category, a technical or programming background is the most common. In other words, they’re doing things with technology they never expected. And they’re learning on the job. While they might not have had a technology education, most of them have recently held a job accountable for technology — they’ve learned on their own the technical skills they need. 4. Just 8.6% of marketing technologists reported to the CIO. And speaking of their job, most of them don’t report into the CIO. Instead, most report into the CMO (31.4%) or CEO (23.9%). In sum, 64% reported into the CMO, CEO, CIO or similar SVP roles. 5. Just 7% of those surveyed have marketing technologist in their title. While 78.9% of companies have an individual or a team to manage marketing technologists in our study, most of them don’t have “marketing technologist” in their title. Instead, marketing, business, or technology titles dominate. 6. Five skills — across both technology and marketing — emerged as table stakes. Our respondents ranked 44 job skills by importance for the future of marketing; the top five are listed below. In fact, later in the survey, 94% of respondents said they believed that marketing skills and IT skills could be combined into a single person. 7. Surprisingly, there are large skills gaps in both technology skills and, to a lesser degree, marketing fundamentals. The marketing technologist of today may not be trained in traditional technology, but they’re increasingly being asked to provide expertise on these areas. Marketing technologists identified significant gaps in the hard technology skills they ranked as most important — big data and customer relationship management. But they also noted gaps in marketing fundamentals: target market identification, for example, was the #2 most important skill, yet most respondents felt it wasn’t a particularly strong skill of theirs (22nd out of 44). Market segmentation and psychographics also emerged as key gaps. The role of the marketing technologist is a hybrid, but there seems to be significant gaps on both the marketing and the technology side. 8. Marketing technologists are much more excited than stressed. To close out the study, we asked how excited and stressed marketing technologists are. The good news — they are much more excited than stressed. 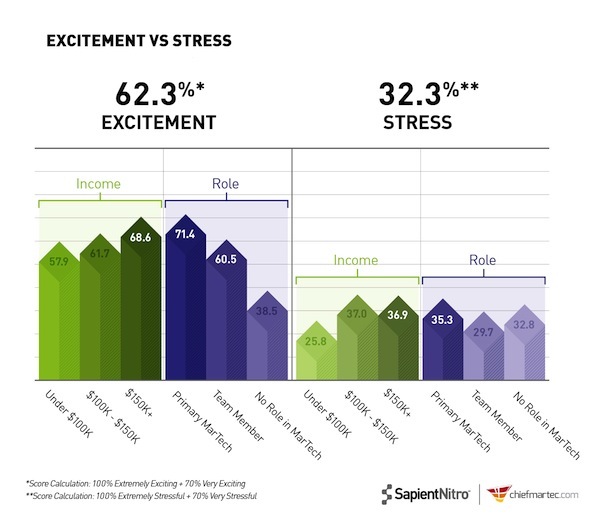 62.3% reported being extremely or very excited, but just 32.3% reported being extremely or very stressed. And stress didn’t increase significantly as income increased — but excitement did. The survey was an online questionnaire and survey link distributed through two primary channels — chiefmartec.com and the 2014 Boston MarTech conference (August 18-20). No maximum sample quotes or screening criteria were set. Survey responses were collected from August 15 to September 8. A total of 280 surveys were completed. The distribution of the sample appears to be representative of the marketing technology community, as defined by this blog and attendees from the 2014 Boston MarTech conference. SapientNitro sponsored the study, working with Decision Analyst, a market research firm, to design and execute the study. These are the preliminary findings — look for the full results coming out in end of October. Note: This was a guest article written by Hilding Anderson, Director of Research & Insights at SapientNitro. Special thanks to Sheldon Monteiro and Scott Tang. A good read — I’m a bit concerned over the idea that nearly half of “Marketing Technologists” come from Technology jobs. I believe it’s important to be a marketer first & technically strong second. There’s a world of difference between a marketer who has learned technology — and a technician learning marketing. Remember, it’s about marketing — technology is just a tool. I for one, think it’s high time that database & direct marketing professionals get more consideration — we know segmentation & targeting better than any — we’ve got the data & analytic skills and we possess the discipline to make sure that everything gets tracked and measured. We’ve also adopted contemporary CRM and Marketing Automation technology — if anything, we might be a bit weak in the “Marketing Strategy & Positioning”. Great point! Agree with the sentiment of the question, but, how to execute is still at the core of the Marketing Technologist’s role. Your Marketing Technologist is not doing creative, not designing a campaign, etc.. They are focused on helping you put in place all the necessary infrastructure, data, technology, integrations with vendor partners to make it happen! It’s one thing if you rely heavily on vendor partners, then, someone from more of a business background might work out, but, if you manage your own customer data management platform (DMP) and act as the hub for all multi-channel marketing activities you need deeper technology and partner integration expertise. Excellent article Scott! Thanks! I definitely resonated with your article and research findings. As a Marketing Technologist myself, I often wear many hats in the six archetypes you outlined. I guess it’s refreshing to know that I’ve been sharpening my saw in the right places. Best regards!